Nothing focuses a politician’s mind like staring at oblivion, and reluctantly contemplating himself at the center of that dark and dreary place. Though it may be too late to save himself, Nicolas Sarkozy is scared contrite and humble, a remarkable precedent for a French president. On the eve of Sunday’s voting, he offered an apology for his “mistakes,” telling a television interviewer that when he was elected he did not “immediately understand the symbolic dimensions of the presidency.” This might be loosely translated from the French as, “I didn’t have a clue to what I was doing.” Hardly a confidence builder. The 57-year-old President Bling Bling, as the newspaper and television correspondents, ever eager for hot copy, call him, appears to be on his way to looking for work unless he can figure out a way to survive a run-off election against Francois Hollande, also 57, the Socialist. Only rarely does an incumbent anywhere survive a run-off, especially if he’s the runner-up in the first round. He’s the first incumbent to run second. 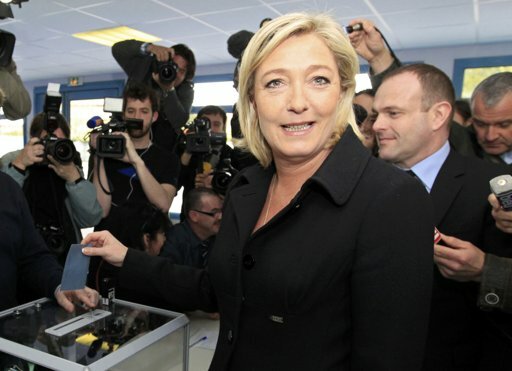 Many of Marine Le Pen’s followers see Sarkozy and Hollande as equally eager to preside over France’s decline. Nevertheless, M. Sarkozy, written off a week ago, surprised everybody with a close finish, polling 27 percent of the vote, just barely behind M. Hollande’s 28.2 percent. The stunner was Marine Le Pen, 43, of the far right National Front, who won about 18 percent and finished a very respectable third. A lot of Frenchmen, surveying a sick economy, rising taxes, the worst unemployment rate (at 10 percent) in 12 years and waves of Muslim immigrants, many of them illegals, vow they’re “mad as hell and aren’t going to take it anymore.” This may sound familiar to Americans. M. Hollande, like any good Socialist – it’s not a libel to call a man a Socialist in France – prescribes confiscatory taxes as the proper medicine for a sick economy. He, like another president we know well, doesn’t understand that trying to dig yourself out of a hole only makes the hole deeper. He promises “growth over austerity,” but it’s not clear how taxing millionaires at 75 percent of their annual income, which he proposes to do, will encourage growth. President Bling Bling prescribes stiff medicine, cutting spending and services, to avoid making France over in the Greek model. This is never popular with anyone, particularly in France, where the free lunch is an institution, like “liberty, equality and fraternity.” President Bling Bling is not exactly the perfect physician to prescribe this medicine, since M. Bling Bling and his wife, the glam ex-model and pop singer Carla Bruni, are paying now for living the high life and putting it on public display. The French chattering class – and nobody does chatter better than the French – have all but written off M. Sarkozy. One prominent pollster, Eric Bonnet of the BVA polling firm, sounds as he has already been to the future. But in politics, in France as everywhere else, all things are never equal. Sarko, as the French press calls him, campaigned at a decided disadvantage in Round One. French law requires television to give equal time to all candidates, and this created a piling on effect, with each of the Sarkozy opponents vying to say the sharpest hostile things about him. In Round Two, it will be man to man, Bling Bling against the Waffle. 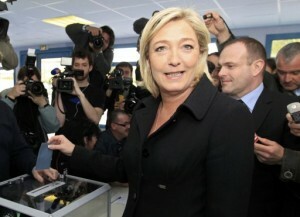 The big imponderable in Round Two will be the role of Marine Le Pen and her 18 percent. Many of her followers sneer at Messrs Sarkozy and Hollande as equally eager to preside over a permanent decline of France, reduced to a mere cultural presence, stripped of political and military prowess. May 6 is D-Day.